Citation: Sawa Y, Cherian KM, Mohanty S, Ganesh JS, Abraham S. An invention of thermo-responsive polymer surface, yielding cell sheet based regenerative therapies in cardiology and ophthalmology. 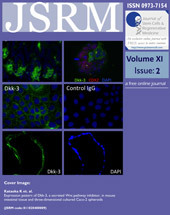 J Stem Cells Regen Med 2015; 11(2):51-53. In vitro cell culture methodologies provide a conducive environment for the cells taken out of their native environment to grow and proliferate in a non-physiological environment, the culture dish. Research experiments have been focusing on various criteria for assessing how far it is possible to recapitulate the native extra-cellular environment in vitro. Scaffolds, culture media, growth factors and cell surface modified culture dishes are some of the components that provide a conducive environment for in vitro cell culture. Cells that are grown in culture dishes using conventional methodologies are usually detached using enzymatic treatment with Trypsin, Collagenase etc , to be transplanted when it comes to a clinical or experimental application. Such enzymes used in separating the cells may have some damaging effects to the cell membranes which might impair the cell function . However, cells if can be grown as a monolayer and be harvested as a contiguous cell sheet, it is considered suitable for transplantation in certain specific applications. In addition to that, if enzymatic digestion which has some detrimental effects on the detached cells could be avoided, that is an added advantage. The work by Prof. Okano and team from the Tokyo Women's Medical University, Japan, on thermo-responsive polymer surfaces has yielded a solution which has both the advantages viz., detachability of cells grown as a monolayer in the form of a cell sheet, that too without the use of enzymes. Their research into biomaterials for more than two decades has yielded a thermo-responsive polymer, the poly(N-isopropylacrylamide) (PIPAAm)  coated culture dish for cell sheet engineering. In their technology, PIPAAm is polymerized and grafted to tissue culture polystyrene (TCPS) dishes. Cells have been found to grow confluent on PIPAAm-TCPS at 37 °C. Once confluent as a monolayer, by merely reducing the temperature of the PIPAAm-TCPS to 20 °C, it can be easily detached as a single contiguous cell sheet. The alteration of the surface from a hydrophobic to a hydrophilic state with the lowering of the temperature from 37 °C to 20 °C enables this easy separation which is the unique feature of this technology . Different kinds of cells have been shown to adhere to, spread over the PIPAAm gel modified TCPS (PIPAAm-TCPS) and grow as cell sheets without any change in their respective phenotypes . Cardiovascular diseases remain the leading cause of death in the world. In 2010, 29.6% of all deaths worldwide were caused by cardiovascular diseases . Conventional medical strategies for the treatment of heart failure resulting from myocardial infarction do not attempt to correct the underlying cause (i.e. loss of viable myocardial tissue), thereby raising the need for strategies aimed at myocardial regeneration and repair. At the other end of the spectrum, cardiac transplantation provides radical therapy, however, the donor organ shortage and strict eligibility criteria, mandate alternative treatments when a substantial portion of the myocardium has been destroyed. In this context, cellular cardiomyoplasty using cells and stem cells have been emerging as a possible means of regenerating damaged myocardium by preventing myocardial necrosis and promoting angiogenesis and myogenesis. Different kinds of cells and stem cells have been employed for treating heart failure. For instance, a team led by Prof. Cherian has employed granulocyte colony stimulating factor (GCSF) induced peripheral blood derived CD34+ endothelial progenitor cells (EPCs) or iliac crest bone marrow-derived mononuclear cells (MNCs) in treating 104 patients suffering from ischemic/dilated cardiomyopathy (autologus EPCs: 19 patients including allogenic paternal EPCs for one patient, autologus MNCs: 90 patients) at Frontier Lifeline Hospital in Chennai, India. A clinical trial was registered (CTRI/2009/091/000590) after standardizing the procedures for collection of autologous bone marrow cells in January 2010. Out of the 104 patients, 68 patients met the inclusion criteria for the trial follow up. Of the total, 45 patients could not be followed up in spite of the team’s best efforts to trace them. Only 23 patients (34%) were available for follow up. Amongst those, 19 patients (82.6%) were alive at the end of the first year and 10 out of the 19 patients (52.6%) had at least a 5% increase in the Ejection Fraction post therapy and had significant improvement in the functional status. The procedure was safe in all the other patients which were similar to the results of other studies reported so far. Though the results of this clinical trial infer that stem cells are not an alternative to heart transplantation they offer a 'dynamic cellular support' for regenerating functional and viable myocardium. As a step further in identifying definitive cell based therapy approaches to treat heart failure, cell sheet therapy was advocated by Prof. Sawa’s team. In Prof. Sawa’s Institute, longitudinal research team was launched in the late 1990s to develop new treatments for advanced cardiac disease by an array of basic experimental studies of surgical and regenerative approaches. As a result, placement of autologous or allogeneic stem/progenitor cell-sheets over the cardiac surface via surgical approach was proven to be the most safe and efficacious treatment for advanced cardiac failure. To grow the skeletal myoblasts as a sheet for clinical transplantation, Prof. Sawa’s team employed the thermo-responsive polymer dish developed by Prof. Okano’s team which enabled the in vitro growth of the skeletal myoblasts as patches and their easy separation for application over the ischemic/infarcted area of the heart after thorough validation in animal experiments . A clinical study was, therefore, launched in 2006, wherein autologous skeletal myoblast cell-sheets were directly placed on the cardiac surface under general anaesthesia  for more than 30 patients with an ejection fraction below 35%. In this study, the cell-sheets were successfully placed without any procedure-related mortalities or morbidities, demonstrating the feasibility and safety of this treatment and importantly, majority of the patients have shown recovery of cardiac function and physical symptoms to date, indicating that this single treatment yields sustained functional recovery in patients having advanced cardiac failure . This autologous skeletal myoblast sheet therapy to treat heart failure was conditionally approved as a cellular product in Japan on 2nd September 2015 . While cardiac diseases are the leading cause of death throughout the world, it is disheartening to note that there are 180 million people in the world with severe visual disability . Corneal diseases follow cataract in being the second leading cause of blindness in these people . The cornea is a five layered structure consisting of the Epithelial layer, Bowman’s membrane, Stroma, Descemet’s membrane and the Endothelium. Standalone corneal epithelial damage along with total damage of all the five layers of the cornea are considered to be contributing to 50% of the corneal blindness, as one half of the corneal transplantation indications to treat corneal blindness has been attributed to standalone corneal endothelial diseases . In the case of corneal epithelium, limbus is the portion that harbours stem cells which repair the corneal epithelium. Cultivated limbal epithelial transplantation (CLET) is used for the management of limbal stem cell deficiency (LSCD) . While biological scaffolds like human amniotic membrane have been used to culture and transplant the limbal stem cells, synthetic scaffolds like the thermo-reversible gelation polymer (TGP) offers potential advantages over biological scaffolds . The TGP based limbal stem cell transplantation has been demonstrated successfully in animal model of limbal stem cell deficiency . While the above is suitable for unilateral LSCD, in the case of bilateral total LSCD, corneal stem cell allograft transplantation  or cultivated oral mucosal epithelial transplantation (COMET) are the treatments of choice available at the moment. In the COMET procedure, autologous oral mucosa is cultured and transplanted to the affected corneas. There are no risks of immune-mediated rejection and in the absence of autoimmune disease, immunosuppression is not required. While the epithelial sheets from the autologous mucosa are cultured, use of thermo-responsive culture dishes have enabled a carrier-free epithelial cell sheet transplantation as the cell sheets after in vitro culture can be detached by merely lowering the temperature of the thermo-responsive culture dishes . These oral mucosal epithelial sheets have been transplanted in patients with corneal epithelial diseases with positive outcome . Myocardial regeneration using skeletal myoblast patches which has become an approved cellular therapy . A solution to bilateral corneal limbal stem cell deficiency by transplantation of autologous oral mucosal epithelial sheet . In both the applications, transplantation of cells as a monolayer-sheet instead of dispersed cells has been proven to be advantageous. In cornea the entire surface can be uniformly covered if a cell sheet is used rather than transplantation of clumps of cells logically and the mechanism of the regeneration has been shown to be the replacement of the damaged corneal epithelial cells with the transplanted cells . In case of myocardial regeneration over an area of ischemic or infarcted myocardium, transplantation of a cell sheet not only anatomically covers the surface area of the affected portion but on the other hand, transplantation of dispersed cells alone even when accomplished, retaining them to a certain period until the regeneration of the diseased myocardium may require an additional scaffold to support those cells in place. Such retention scaffolds for dispersed cells become absolutely redundant with this cell-sheet development. Cell sheet engineering technology, developed by a biomaterial scientist has led to successful clinical applications in treating patients with end stage heart-failure and blindness due to corneal epithelial damage as reported by a number of institutes. Their further propagation, after necessary validations, has a potential of providing a solution to multitude of patients suffering from such illnesses. Inter-disciplinary interactions within and across various domains of science as reported here are essential to bring novel solutions in regenerative medicine which is the result of a teamwork among physicians, clinical scientists, cell biologists, biomaterial experts, chemists and physicists. Yamada, N., Okano, T., Sakai, H., Karikusa, F., Sawasaki, Y. and Sakurai, Y.Thermo-responsive polymeric surfaces; control of attachment and detachment of cultured cells. Makromol. Chem. Rapid Commun. 1990; 11: 571–576. Tang Z, Akiyama Y, Okano T. Temperature-Responsive Polymer Modified Surface for Cell Sheet Engineering. Polymers 2012, 4, 1478-1498. Nichols M, Townsend N, Scarborough P, Rayner M. Cardiovascular disease in Europe 2014: epidemiological update. Eur Heart J. 2014;35(42):2929. Hata H, Matsumiya G, Miyagawa S, Kondoh H, Kawaguchi N, Matsuura N, Shimizu T, Okano T, Matsuda H, Sawa Y. Grafted skeletal myoblast sheets attenuate myocardial remodeling in pacing-induced canine heart failure model. J Thorac Cardiovasc Surg. 2006;132(4):918-24. Sawa Y, Yoshikawa Y, Toda K, Fukushima S, Yamazaki K, Ono M, Sakata Y, Hagiwara N, Kinugawa K, Miyagawa S. Safety and Efficacy of Autologous Skeletal Myoblast Sheets (TCD-51073) for the Treatment of Severe Chronic Heart Failure Due to Ischemic Heart Disease. Circ J. 2015;79(5):991-9. Whitcher JP, Srinivasan M, Upadhyay MP. Corneal blindness: a global perspective. Bull World Health Organ. 2001;79(3):214-21. Epub 2003 Jul 7. Terry MA. Deep lamellar endothelial keratoplasty (DLEK): pursuing the ideal goals of endothelial replacement. Eye (Lond). 2003 Nov;17(8):982-8. Ramírez BE, Sánchez A, Herreras JM, Fernández I, García-Sancho J, Nieto-Miguel T, Calonge M. Stem Cell Therapy for Corneal Epithelium Regeneration following Good Manufacturing and Clinical Procedures. Biomed Res Int. 2015;2015:408495. Nishida K, Yamato M, Hayashida Y, Watanabe K, Yamamoto K, Adachi E, Nagai S, Kikuchi A, Maeda N, Watanabe H, Okano T, Tano Y. Corneal reconstruction with tissue-engineered cell sheets composed of autologous oral mucosal epithelium. N Engl J Med. 2004;351(12):1187-96. The Inventions- Inter-Disciplinary Interactions and Solutions (IIDIAS) is an academic session, which is conducted as a part of the one-day International stem cell meet ‘NCRM NICHE’ organized every year in October by the Nichi-In Centre for Regenerative Medicine (NCRM),an Indo-Japan academic Institute based in Chennai, India. In the IIDIAS session, inter-disciplinary interactive research work that are based on the inventions/discoveries in regenerative medicine are presented by relevant experts followed by an interactive session in which the futuristic directions of the accomplishments are discussed. The IIDIAS session 2015 was based on an invention of thermo-responsive polymer cell culture surfaces that has led to successful cell sheet therapy to treat cardiac and corneal diseases.